I know it sounds silly, but having the opportunity to be a zombie last Sunday night was one of the highlights of my life. Having heard a "rumor" early Sunday morning about a zombie flash mob happening after close at Dickens, I quickly filed it away under "amusing notes for the day," and didn't really think much of it. Throughout the day I really didn't hear anything else, and for the most part completely forgot about the whole victorian zombie concept. Around 4pm, we figured it was about time to take TheGlen to the airport, and said our goodbyes, not planning to return to the Cow Palace that evening. But, once we left the airport and realized how early it was, we decided a couple more hours of Dickensian fun couldn't hurt and returned to the Dickens Fair. 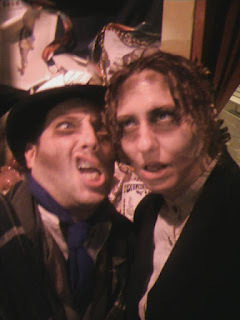 It was later that evening one of the guys approached me and asked, "so, are you going to be a zombie?" The thought hadn't even occurred to me. The first thing out of my mouth was, "Can I? Yes, please!" We wandered over to the right place at the right time but when the call for "background zombies" came, I hesitated.... for about half a second before tugging on CSB's sleeve, and dragging him into position. We waited eagerly for make-up to come by and dust us with black accents then giggled our way through the first rehearsal. I think it was near the middle of the whole thing when I realized just how nice it is to have a "partner" in life. A person who enjoys many of the same things you do and who is right there by your side when acting silly is the order of the day is just as important as someone who has your back if things go wrong. Thank you for posting this video..
My goodness I have awesome friends. I just want to squeeze Leland!! !